"In the Yatil Mountains south of Perrenland there is rumored to be a magical hoard of unsurpassed value, a treasure of such fame that scores f adventurers have perished in search of it. Find the perilous Lost Caverns of Tsojcanth and you may gain the hidden wealth of the long-dead arch-mage -- if you live! " The resources of the OSR are vast & very expansive, there are literally hundreds of D&D like clones & systems on the market today. But again & again I find myself reaching for the classic modules, especially those with a Pulp bent. I'm speaking today of Gary Gygax's S4The Lost Caverns of Tsojcanth. 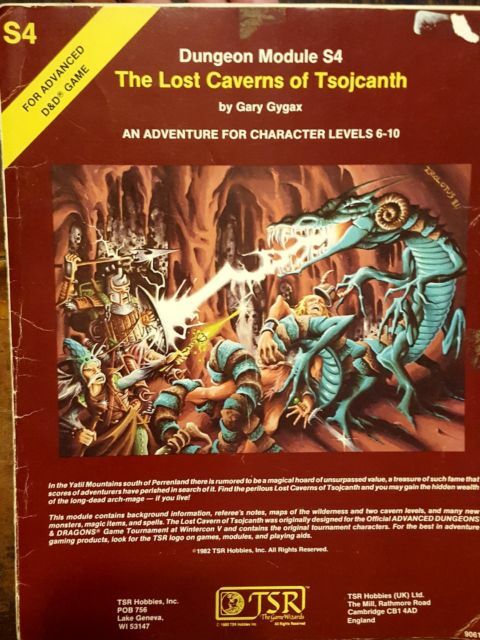 I've been thinking about using S4The Lost Caverns of Tsojcanth for my Pulp home game. 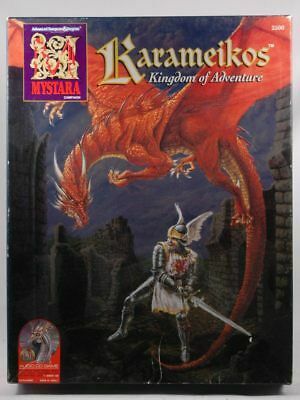 The reason why is that this classic module has several Greyhawk elements that allow the dungeon master to connect it with their home campaigns. "Lawrence Schick, in his 1991 book Heroic Worlds, described the adventure as "A monster-filled labyrinth in the classic mode: kill 'em, rob 'em, and leave." Schick goes on to say this about the 2013 Dungeons of Dread hardcover collection; Lawrence Schick writes in the foreword that "S4 The Lost Caverns of Tsojcanth marked the end of the S series—and rightly so, because despite being based on a gilded-hole dungeon originally designed for a tournament in 1976, its updated version really belonged more to the '80s campaign-setting school of design than to the wild-and-woolly '70s. S1 through S3 were standalone modules that could be easily dropped into any DM's campaign, but Tsojcanth is firmly based in Gary's World of Greyhawk." Well officially it is. Or is it?! Well I've been doing some research & stumbled across this little gem by Demos Sachlas entitled Original Lost Caverns of Tsojconth - found in Karameikos?
" the first page of the adventure states that "the caverns of Tsojconth are a nexus in probability, where several alternate worlds touch" and so a location on Mystara is quite plausible." 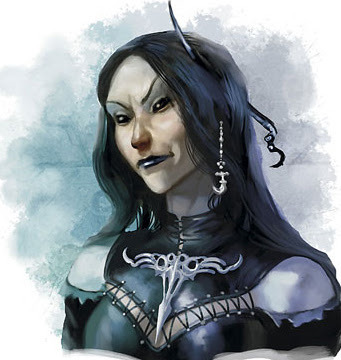 So not only is the archmage Iggwilv likely to appear in a wide variety of campaigns she's perfectly suited to have multiple bands of adventurers getting murdered from across the planes under her purview. Mystara, Greyhawk & Blackmoor's influence can be felt across the planes. Their world events echoes affect scores of worlds across the planes. Now I've talked at length last year about how Drelnza's awakening could be the start some of the major shifts in history on some alternative form of Earth as chaos cults rush to the dungeon temple. There are definitive connections to Merlin & some of the Clark Ashton Smith stories of Averoigne. But this is only the start of problems really the archmage Iggwilv had lands & interests throughout the prime material planes. So in all likely hood there's her handy work throughout the worlds. This could include your own home campaign. The witch queen is going to be a major mover & shaker in whatever world she appears in. Artwork is from this Wiki here. 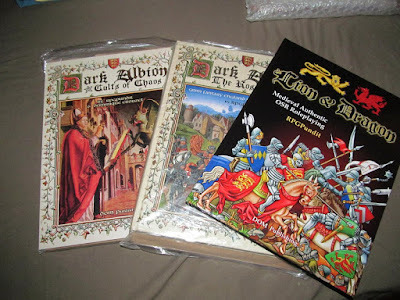 I've talked at length about running the Hundred Years War with Dark Albion along with the Lion & Dragon rpg. But the DM has to understand the level of depravity that Drelnza, a fighter/vampire and the daughter of Iggwilv as well as her mother bring to the table. She was/is a major enemy of Hell itself. If she feels she needs to destroy a world then she will without a doubt & she has the might to do it. This is where the lost Greyhawk module aspect of S4 comes into play; "Lawrence Schick later suggested that "there's evidence that Gary considered Tsojcanth part of a longer Greyhawk campaign, placing the adventure between T1–T4 The Temple of Elemental Evil and WG4 The Forgotten Temple of Tharizdun. (By this reckoning, The Village of Hommlet, The Temple of Elemental Evil, and Tsojcanth are thus the "lost" WG1 through WG3 modules.) So, Tsojcanth was published in the S series because it got completed out of order, but was too good to delay." WG4 The Forgotten Temple of Tharizdun takes the PC's into one of the major hearts of corruption of this cycle of modules. The appearance of an entrance to one of the dungeons of these modules is going to raise major alarm bells in the halls of power for those in the know. I'm not saying this lightly at all but once the discovery of one of these dungeons appears especially the Lost Caverns of Tsojcanth then the campaign is going to shift into over drive. I've run inquisition & investigation mini game campaigns with T1–T4 The Temple of Elemental Evil, WG4 The Forgotten Temple of Tharizdun. The Village of Hommlet, The Temple of Elemental Evil, and Tsojcanth at its center using Dark Albion & Astonishing Swordsmen & Sorcerers of Hyperborea. The results were not pretty & there were more then a few TPK's in the offering.